Budget accommodation in New York is pretty much an oxymoron. As this was the last week of our honeymoon, we decided we would “splash out” (a relative term), and find somewhere to stay in a central location that wasn’t horrible. We settled on City Rooms NYC, which I wouldn’t describe as a hostel or a hotel, but more as something in between. We were lucky to get our own room (though not our own bathroom) within walking distance to the Empire State Building, Macy’s, and Times Square. 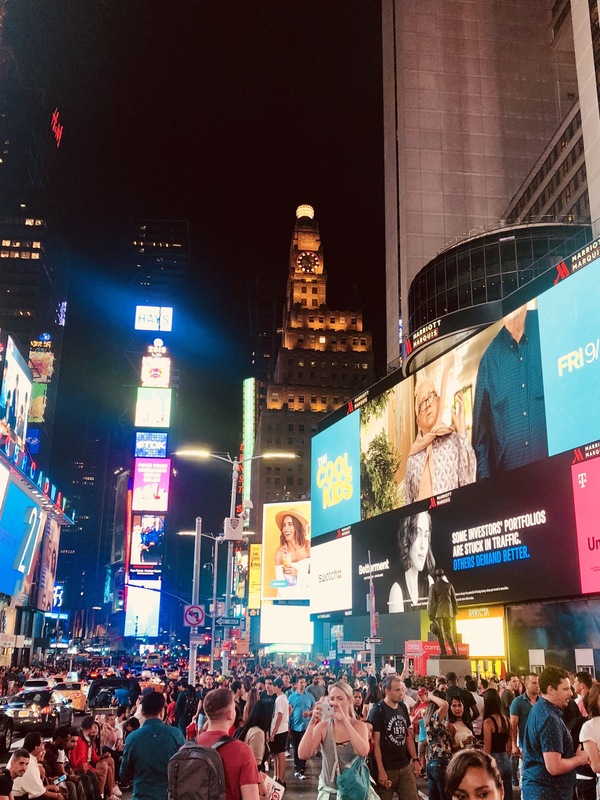 On our first evening we walked along the busy, vibrant streets towards the lights and the buzz of Times Square. While clearly a bit of a tourist trap, it was fun to see all the billboards and people in fancy dress! The next day we took the subway to the World Trade Centre, and the 9/11 memorial and museum. Having negotiated several public transit systems all around the world over the past year, we weren’t expecting to struggle with the New York subway. Google maps helpfully told us we needed to catch the red line (the number two or three) from 28th Street to Park Place, so we duly arrived at the 28th Street subway station. It didn’t take long for us to get confused. According to the sign, only the number one red line stopped at the station. When we got underground and went through the turnstiles, we failed to realise that the side of the road you enter the station on above ground determines which direction you can travel on (it was just luck that we had ended up on the right side). The first train to stop was the number two, despite the fact that apparently only the number one stopped at the station. The announcements on the subway were incomprehensible, and the one map in our carriage didn’t match up with the stations that we were stopping at. Nevertheless, we managed to get off at the right stop, and made our way towards the September 11 Memorial Museum. 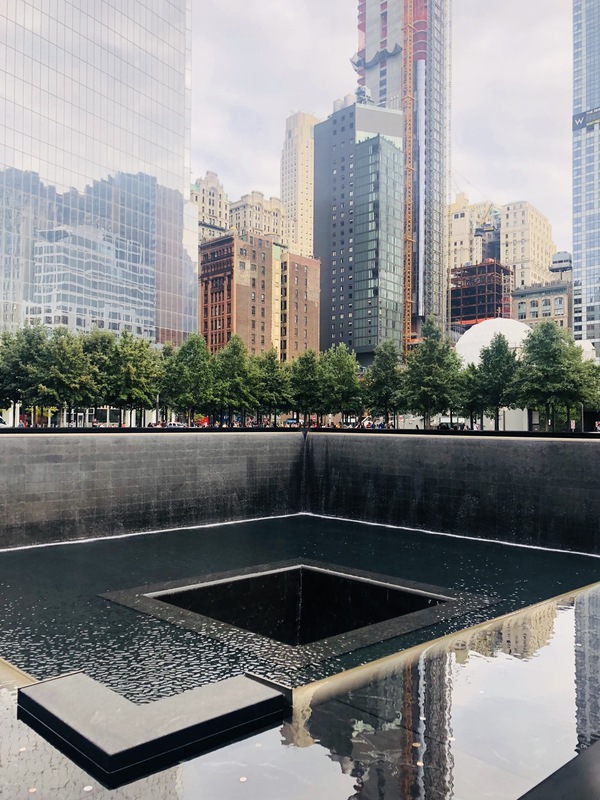 I last visited New York with my family in 2004, when the site where the twin towers once stood was a huge, empty void. Since then, the area has been transformed. Shiny new skyscrapers tower over an elegant memorial, a modern transportation hub and the underground museum. After an hour-long wait, we entered the museum. We started by watching two films, one about the events of September 11, and the other featuring George W. Bush, Condoleezza Rice and Tony Blair, justifying their actions after the terrorist attack. Then we started to explore the vast underground complex. The museum contains more than 40,000 images, 14,000 artifacts, 3,500 oral recordings, and over 500 hours of video. It was well done, powerful and moving. The admission fee and queuing were well worth it, and Shane and I spent the whole afternoon reflecting on the terrible events of that day, and the subsequent impact on the world. After five or six hours of walking around the museum, we expected it to be dark once we got outside and back to ground level. 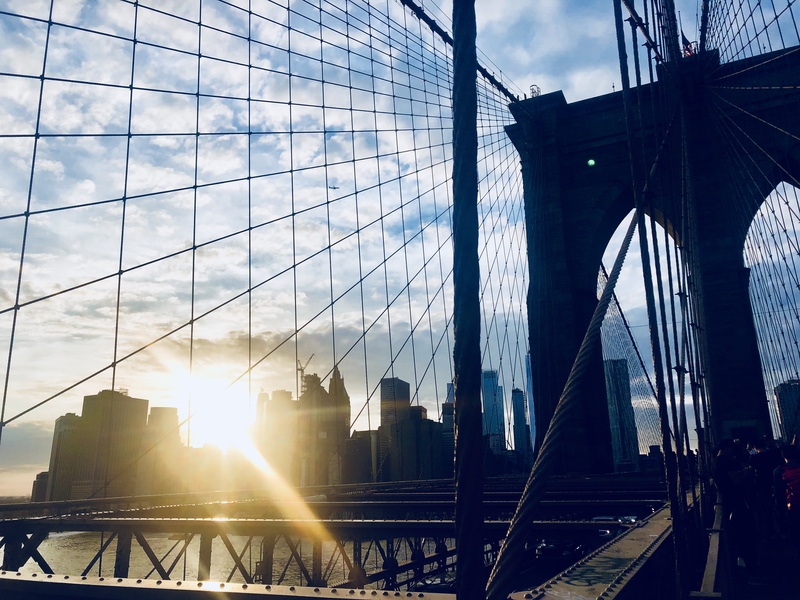 In fact the sun was still shining, so we decided to walk across the Brooklyn Bridge and watch the sun set over the skyline. The next day we took the subway to Central Park. We had decided to do a free, self-guided walking tour of the main sights, but had somehow failed to completely grasp the scale of the park. Three hours and six miles later, we were still only halfway through, but it was great to see lots of hidden gems that we wouldn’t have otherwise known existed. 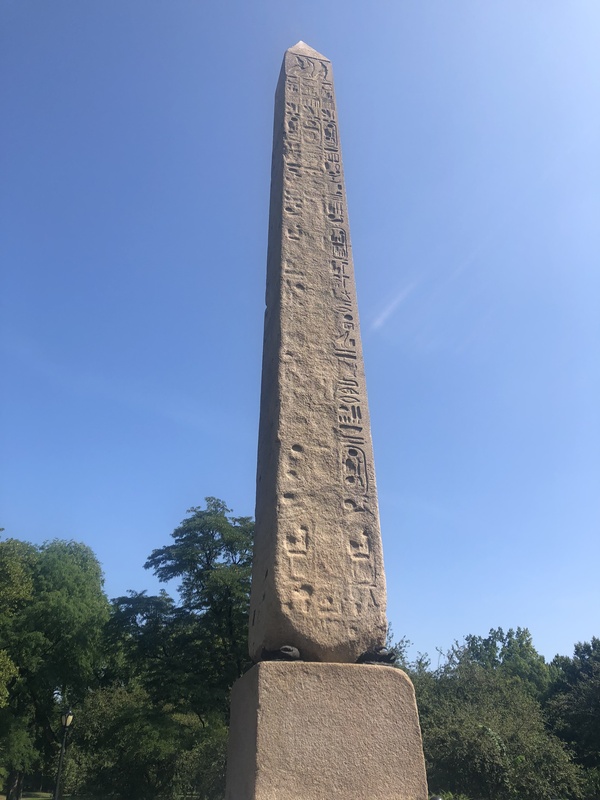 Highlights included the beautiful Bethesda Fountain and Terrace, the sea lions at the Central Park Zoo, the chess and chequers house filled with board games, Cleopatra’s Needle (an ancient Egyptian obelisk) and an Alice in Wonderland statue. 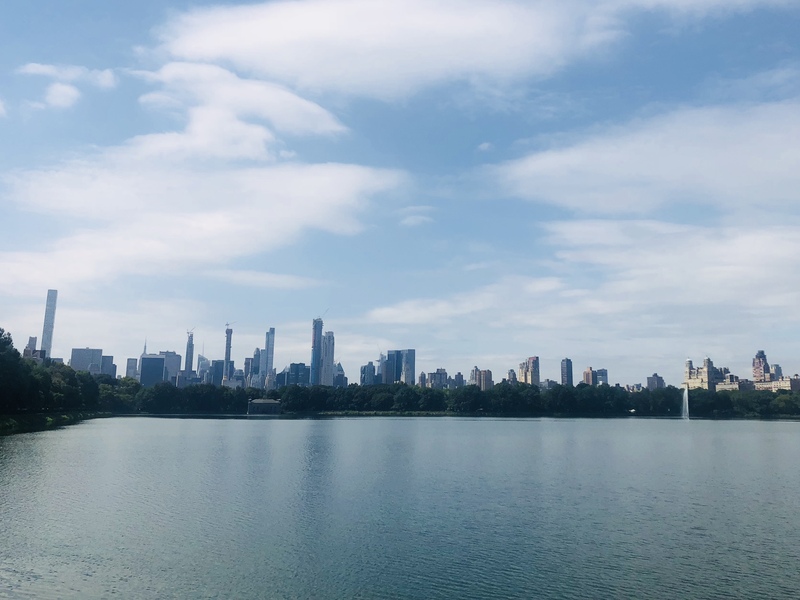 As we approached the upper end of the park, we made a slight detour to visit the Museum of the City of New York. The museum contained various exhibits about the history of the city, as well as an interesting interactive section where you could design a city for the future. 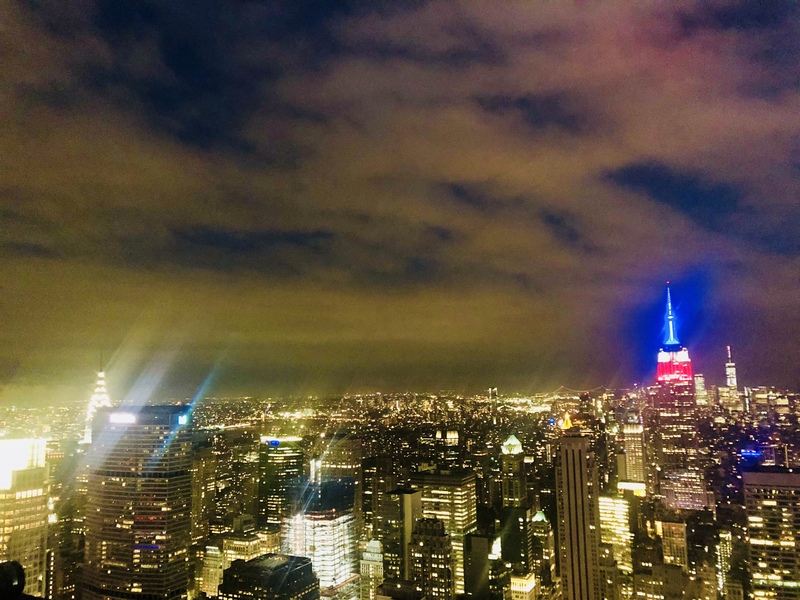 We then spent the afternoon visiting the shops and walking along Fifth Avenue, before ascending to the top of the Rockefeller Centre for a sunset view of the city. 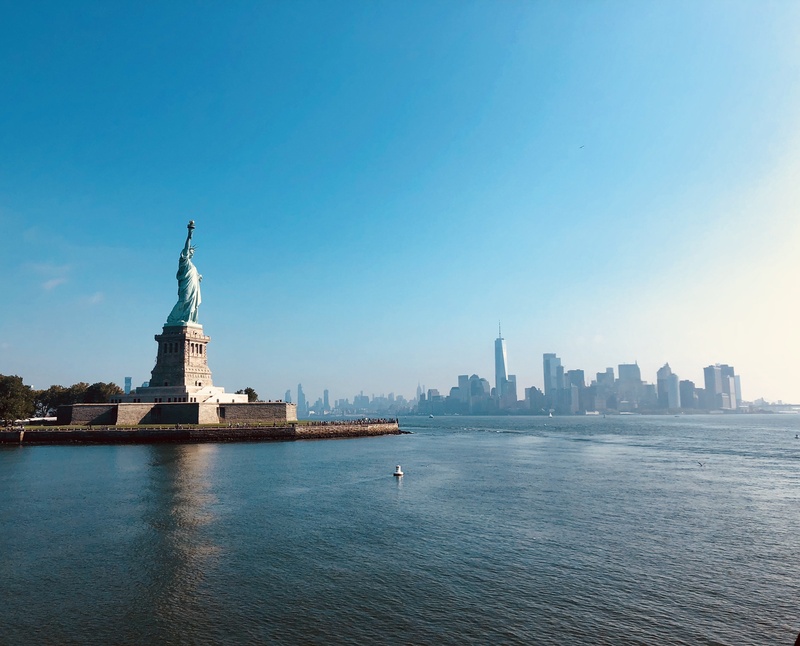 We also visited the Statue of Liberty and Ellis Island – a whole day trip that involved packed ferries, an interesting audio tour inside the statue, and information overload at Ellis Island. It was interesting to think about the number and the range of people who came to the United States from other countries, and were processed at Ellis Island. The museum emphasized the importance of immigration to the development and success of the United States – something which seems to have been forgotten or lost in more recent years – and it was interesting to reflect on the changes that have taken place since so many hopeful immigrants journeyed to across the Atlantic looking for a better life all those years ago. Our final days in New York involved walking along the High Line (an old elevated railway line that has been redeveloped as a kind of sky park), visiting the Tenement Museum (which shows where and how the poorer immigrants lived when they first arrived in New York), and seeing the new Broadway musical Mean Girls. 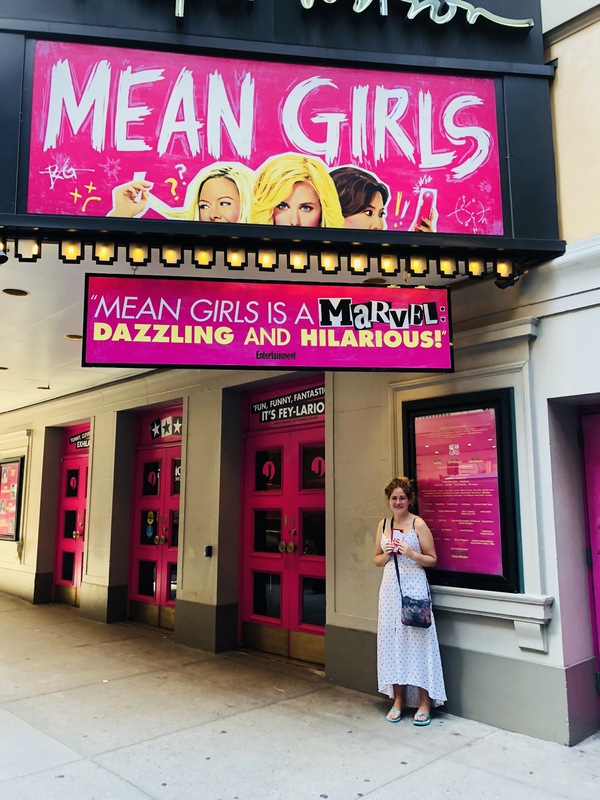 Although it was no Wicked (my favourite musical of all time), Mean Girls was quite hilarious in its own way. I particularly enjoyed the social media references, classic lines, and the fact that I got to know the plastics on a whole new level. After our whistle-stop tour of New York, we boarded a bus bound for New York Stewart airport (if you haven’t heard of it, that might be because it’s nowhere near New York City), and hopped on a Norwegian Airlines flight to Dublin. 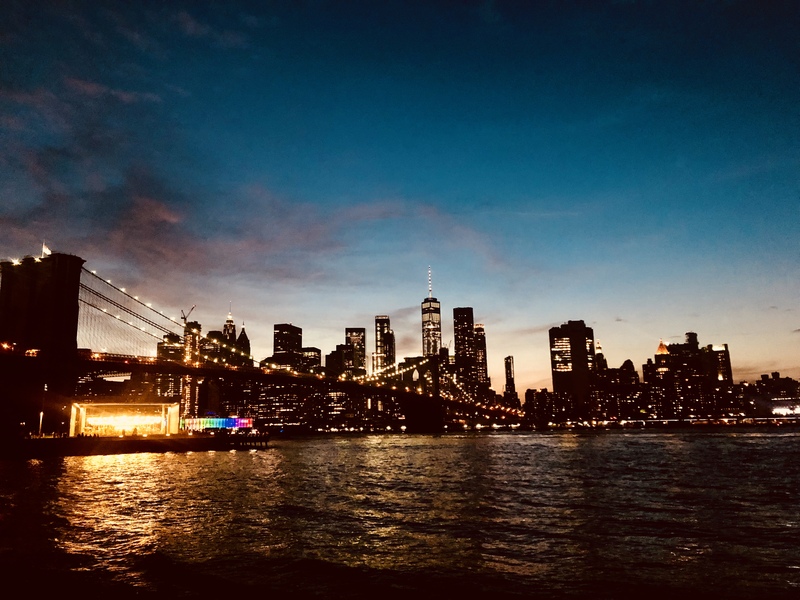 Norwegian Airlines is a no-frills airline: flight prices don’t include baggage, food, drink, films or blankets, and clearly they fly from an airport that shouldn’t be allowed to use ‘New York’ in its name, but as the flights only cost £98, we couldn’t complain. Before we knew it we were back in Ireland, where we watched a couple of Americans struggle to work out whether they should be in the EU or non-EU passport queue (“I’m American, so I guess that means I’m European, right?”), collected our bags, and saw Shane’s parents for the first time since we left home. 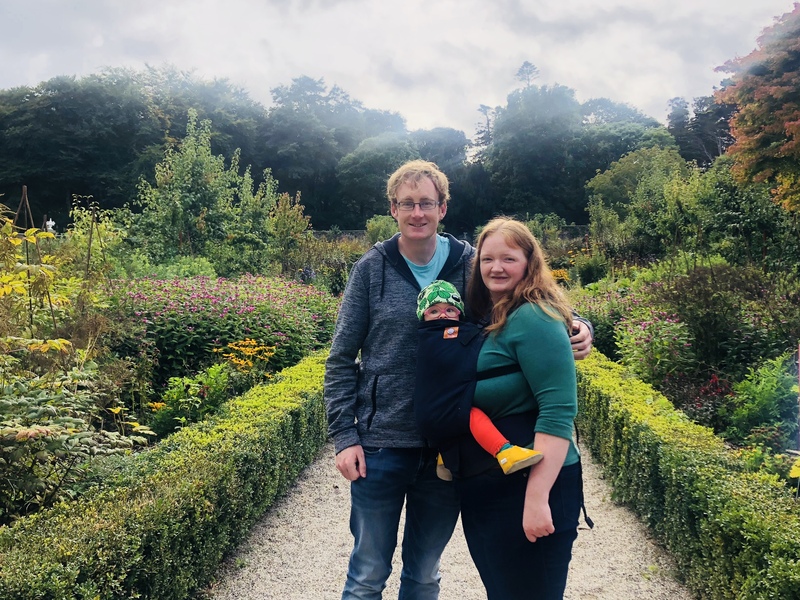 We spent the next week catching up with friends and family in Ireland, spent time with Shane’s niece Áine, and started to adjust to the time zone and climate. We are now back in the UK, right where we started, and ready to commence the next phase of our lives. It’s now more than 14 months since we drove Martha out of Goodwood, crossed the English Channel and started our honeymoon adventure. In that time, we have managed to travel all the way around the world. It has been the trip of a lifetime, and I feel so lucky to have seen so many different countries, have had so many incredible experiences and to have spent so much quality, uninterrupted time with my husband in the first year of our marriage. Over the last year and a bit, we’ve camped in tiny, remote villages on the Tajikistan-Afghanistan border in the Pamir Mountains. We’ve raced through the vast, empty, Mongolian wilderness in a tiny and inappropriate car. We’ve watched the world go by, and made friends with Russian miners on the Trans-Siberian railway. We’ve devoured Korean BBQ in Seoul, and learned to scuba dive in Thailand. We’ve spotted orangutans and Komodo dragons in the far corners of Indonesia. We’ve camper-vanned our way around Tasmania and New Zealand. We’ve visited some of the most remote islands in the world, and sampled paradise in Bora Bora. We’ve hiked in Hawaii, and experienced the original Disneyland in California. We’ve walked with giant tortoises on the Galapagos Islands. We’ve trekked up mountains and down valleys to get to Machu Picchu. We’ve marveled at Iguazu Falls in Argentina and Brazil, and we’ve enjoyed the ultimate city break in New York City. We’ve also dealt with unimaginable bureaucracy. We’ve survived some of the worst boat, bus, train and plane journeys I’ve ever known. We’ve managed power cuts, language barriers, extreme temperatures, high altitude and challenging borders. 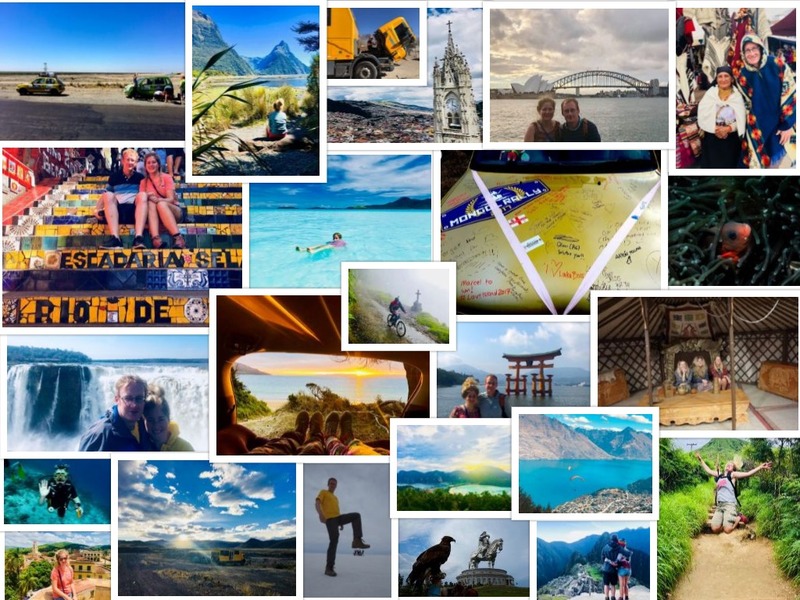 We’ve coped with the world’s most unreliable ferry, an airport sleepover, a stolen phone, some of South America’s most dangerous cities, and continuous driving, flying, camping, and packing. We’ve argued with each other, but we’ve also supported, respected and been there for each other when it mattered most. We’ve questioned what we want from life, and how we want to achieve it. We’ve had the best of times, and the worst of times, and we’ve done it all together. After 14 months of seeing the world and thinking about what is most important to us, we now feel ready to create a home, to find meaningful and fulfilling work, and to develop lasting connections to places and people. 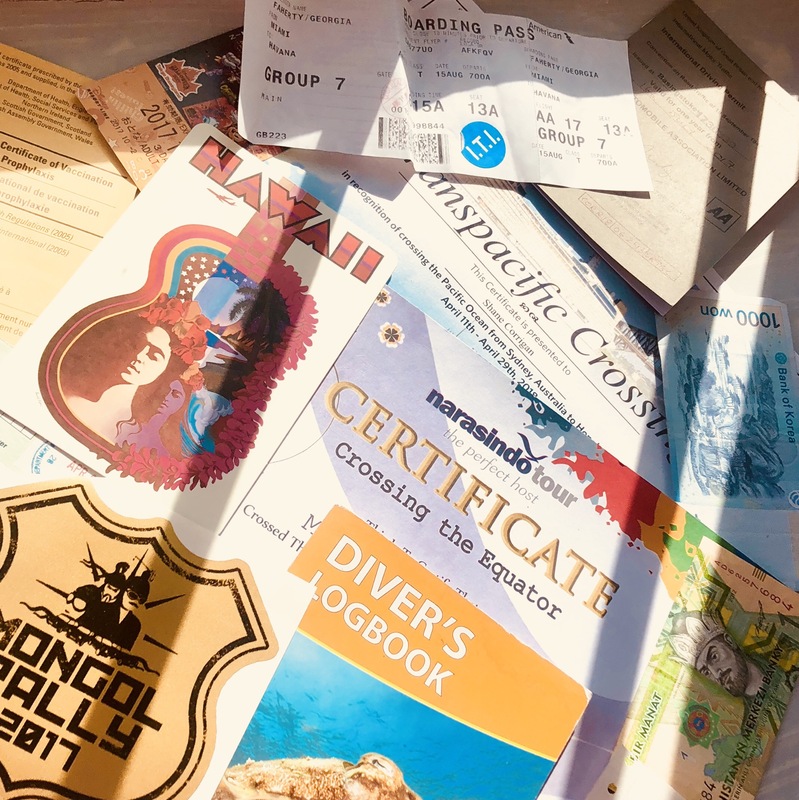 While I am pretty confident that Shane feels just the same as ever (“just fine”), I feel a great deal happier, healthier, more self-assured and more self-reliant than when I left, and I can confirm that I have no urge to ever go on holiday again. Thank you to everyone who has read this blog and followed us on our journey. We plan to post at least one more update in the coming months to share what we plan to do next, and any insights or amusing anecdotes about life after travel, but for now, job applications and rightmove await. To catch up on any blog posts from our adventure, click on the relevant country in the map below, or click here.